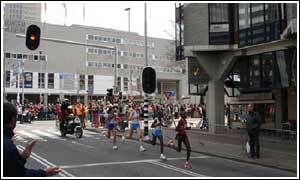 In Canadian Dylan Wykes' final article he covers Rotterdam and the Marathon race itself. I arrived in Rotterdam early in the morning and luckily my hotel already had a room ready for me. I was surprised to find the room was really nice, really big, and really clean. I went down to the Expo pretty soon after it opened to try and get my number, and to try to talk to the race director. Unfortunately, I had a lot of trouble getting into any marathon this spring. I was denied entry to London. 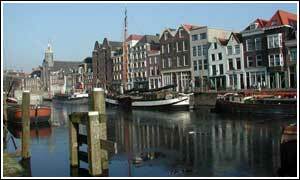 I was originally denied entry to Rotterdam too, but then after begging was given a number, but nothing else. It was a pretty frustrating experience. These big city marathons that have a fast course and can attract top African athletes just do not see the need to help out a guy with mediocre credentials making his debut at the distance. I wanted to see if I could talk to the race director personally to try and at least get my own water bottles. But, I couldnâ€™t even get a conversation with the race director. I spoke to his assistant, who basically just laughed in my face! 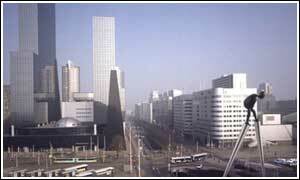 I donâ€™t know much about the history of the city of Rotterdam, but I was surprised at how modern the city is. There are lots of high-rise buildings and lots of modern shopping outlets. I went for an easy 30 minute run a little later on in the day. I wanted to find some of the course (in particular 30-35k, where I figured things would get really tough). But, I got really lost, but luckily never strayed too too far and only had to walk about 10minutes after the 30 minutes of running. I ran through some interesting neighbourhoods, that had a lot of character on this run. If you owned a kebab shop and decided to stay open only 23hrs, which hour would you choose to close? Probably not 1-2pm, right? Well, this place closed then (along with a lot of other restaurants and cafes) which left me eating PB and banana sandwiches in my hotel room. Note to self, donâ€™t try and go get lunch between 1-2pm tomorrow! Today has been a pretty boring day. I have managed to be really good about just 'chillin' out in my hotel room. Usually I get really 'antsy' and want to go explore places. But, I wanted to stay off my feet as much as possible today. I got the entire series of the HBO program â€˜Six Feet Underâ€™ for Christmas. So, I have been watching a lot of that on my laptop. I went out to a pretty good Italian restaurant for dinner (the same place I went to last night). I tried to eat a ton of bread and asked if they could give me an extra large plate of pasta! They thought it was funny that I was eating so much. I actually felt a little sick walking out of the place. I am also sick and tired of drinking carbohydrate drinks. I thought they would be a good way to get in some extra carbs. But, at this point the artificial orange flavour of these drinks is repulsive. The race is at 11.00am tomorrow. So, I am not too worried about getting to bed early. I saw a pretty cool documentary on â€˜The Red Hot Chili Peppersâ€™ on TV. It had some crazy footage of John Frusciante doing an interview when he had quit the band and was a complete junkie. It was pretty scary. I also watched some Masters Golf and I downloaded some videos of different marathons, mostly from the 80â€™s. A lot of stuff with Salazar, DeCastella, and Lopes. The best video was of Steve Jones winning the Chicago marathon in a world record of 2:08:03. That was definitely inspiring for tomorrow! I got up this morning and tried to eat a pretty big breakfast 4 hours before race time. I went for a little walk after that. It looks like a perfect day for a marathon. It may be a little bit windy, but besides that things seem ideal. I have been passing the time fiddling with my racing kit and listening to some music; Radiohead, Sigur Ros, and Interpol. I am now heading to the warm-up area for the SUB-elites! Unfortunately, my lack of experience with the marathon really showed through. I had a pretty straightforward plan (Go out at 2:14pace and try and maintain that to 30km, and then hope I can turn the screws a little and sneak under the Athletics Canada â€˜Bâ€™ standard of 2:14:00. Because I did not get elite status for the event I was not in the same warm-up area as the elites and couldnâ€™t get any information out of the organizers in the SUB-elite area, as to the what pace pacemakers would be going. So, within the first 100m of the race I pulled up alongside Justin Young (an American) and asked him what pace he was trying to run. He said â€˜2:13:00â€™. I asked him if anyone else was trying to go that pace, and he said that there was a pacemaker going that pace. I slowed a little and asked another guy if anyone was going 2:14:00. He said that guy â€“ pointing to the same pacemaker Justin did â€“ is the slowest pacemaker. I looked around and decided to just hang out right around where I was and see if everyone was going to follow the 2:13:00 pace or if anyone would lay off. This in itself was going against my original plan. I was supposed to be content to run 2:14:00 pace, no matter if I had to do it on my own. I went through 5k in 15:43. This felt ridiculously easy, and it was only slightly faster than my goal pace. The group following 2:13:00 pace, were only a few seconds ahead of me at that point. So, I made the fatal decision to just go with them. At that point I stopped looking at my splits and just tried to get comfortable in the middle of the group (out of the wind). The pace felt easy through 10km and 15km. My calves started to get a little bit tight some time between 15km and 20km. But, I just tried to ignore that and focus on running smooth and economical. I realized at 15km that I was almost 45 seconds up on my goal pace. I panicked a little and had a look behind me to see if there was going to be anyone to run with if I slowed down. It didnâ€™t look promising. So, I made the rookie mistake of thinking things would be easier if I just stayed with the group even though the pace was faster than I wanted. But, to be honest this pace wasnâ€™t too hard and when I made the decision to stick with the group I actually started to tell myself I was going to be able to hit the â€˜Aâ€™ standard of 2:12:38. Obviously; in hindsight, this was pure craziness and was clearly just the hormones or endorphines or something polluting my train of thought. I went through the Â½ marathon in 66:00. At that point I was still in the same frame of mind that things were easy and I would be fine. At that point I told myself I had given myself enough of a buffer and should be able to make it in under the â€˜Bâ€™ standard. I allowed the group to go from 25-26k. But then maintained the little gap I had given them to 29km. At that point I have to thank Pacemaker #83 â€“ A Kenyan who was pacing at a faster pace and at that point was just walking, presumable to 30km. I made eye contact with him, for some reason, and he yelled at me, you have to catch those guys. I turned to him and said do you want to help? 5 seconds later he was in front of me trying to help me bridge the gap. At 30k I still hadnâ€™t caught the other guys so I told him to just stop that I would be able to maintain this pace myself! I was fine through 31 and 32km, but started to get a bit worried. My back was getting sore, and my right hamstring was tightening up. I made it to 33km still maintaining well (9:30 for the 3km from 30-33km). But, then we turned into a neighbourhood, with cobblestones. Something about that surface just made every muscle and bone in my body feel crap. I guess it was around this time that I started to hit THE WALL! I got to 35km, having run 6:45 for the last 2km. I worked out that I was still a good 45 seconds up on 2:14:00 pace. I still thought there was a chance I could hang on. 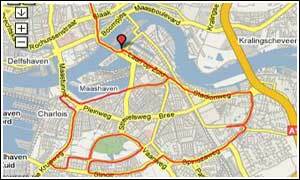 I ran a 3:20km from 35-36km. But then a 3:27 from 36-37km. With 5.195km to go I was at 1:57:03. I was able to calculate that I probably needed to run close to 3:10â€™s. But, I just was not able to. I ran 3:20 from 37-38km. With every step I thought either a calf or a hamstring might snap. Within a few minutes I went from thinking about the standard to thinking about not walking! I ran 3:30-3:35kmâ€™s the rest of the way to the finish and was just really upset at myself for not sticking to the plan. I finished 16th overall in 2:15:16 (gross time) or 2:15:13(net time). I am not sure which to claim as my time? It did take me a few seconds to cross the start mats, so I am going to claim 2:15:13. Here are my splits (according to my watch, not the results found on the race website) 15:43, 31.18 (15.34), 46.56(15.38), 1:02:26(15:30), 1:18:03(15:37), 1:33:58(15:54), 1:50:13(16:15), 2:07:27(17:14! ), 2:15:13. I was really disappointed when I finished, but quickly got on the phone to my coach (Steve Boyd) who was a little disappointed with my first half antics. It is definitely a hard result to swallow. This was a race where, when I was done, I didnâ€™t want there to be any â€˜what ifâ€™sâ€™. Unfortunately, I did not execute the race properly, so there are quite a few at this point. Other people are trying to tell me I should be satisfied with that as a debut marathon. But, I am finding it hard to. I know getting the â€˜Bâ€™ standard was going to be a challenge all along. I am obviously disappointed the dream of being an Olympian will have to wait another 4 years.